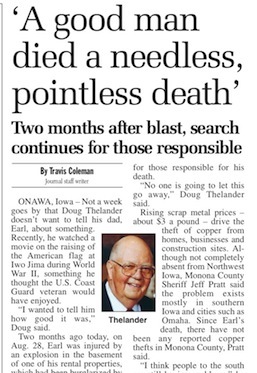 ONAWA, Iowa — Not a week goes by that Doug Thelander doesn’t want to tell his dad, Earl, about something. Recently, he watched a movie on the raising of the American flag at Iwo Jima during World War II, something he thought the U.S. Coast Guard veteran would have enjoyed. “I wanted to tell him how good it was,” Doug said. Two months ago today, on Aug. 28, Earl was injured by an explosion in the basement of one of his rental properties, which had been burglarized by copper thieves hours earlier. Four days later, the 80-year-old who family members said was as fit as a man 10 years younger died at an Omaha burn unit. His injuries were a result of a sliced propane line that ignited while he was cleaning. 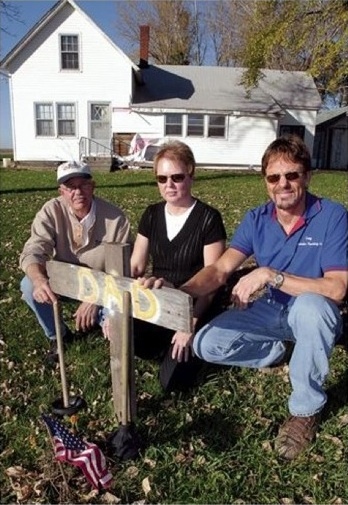 Byron Thelander, Vicki Gray and Doug Thelander pose at a memorial they created at the rural Onawa home where their father, Earl Thelander, 80, died after a home explosion two months ago. He died as a result of burns after the home was broken into and copper thieves cut a propane line. No arrests have been made in the case, and Earl’s family and the Monona County Sheriff’s Office are still searching for those responsible for his death. “No one is going to let this go away,” Doug Thelander said. Rising scrap metal prices — about $3 a pound — drive the theft of copper from homes, businesses and construction sites. Although not completely absent from Northwest Iowa, Monona County Sheriff Jeff Pratt said the problem exists mostly in southern Iowa and cities such as Omaha. Since Earl’s death, there have not been any reported copper thefts in Monona County, Pratt said. “I think people to the south are still having problems,” he said. At times, thieves steal miles of copper wire, leaving thousands of dollars’ worth of damage to buildings and, in the case of Earl Thelander, a family without its patriarch. Sometime between 4 p.m. Monday, Aug. 27, and 8 a.m. the next day, the thief or thieves broke into the unoccupied home at 20877 Gum Ave. in Onawa. They stole about 20 feet of copper tubing from the basement and, in a search for more, cut what they may have believed was a water line, Pratt said. In fact, it was a propane line connected to a furnace. They then left with about $20 worth of copper. Sheriff’s deputies went to the home that Tuesday morning to investigate after they got a call about the burglary. All the while, gas continued to seep out of the severed tubing. Earl, who owned the home but didn’t live there, stopped by to clean up the mess left from the burglary. Around 12:30 p.m., he plugged in a fan to vent the gas fumes and believed the gas had dissipated when the home exploded. “He said it was the brightest flash he’d ever seen,” said Byron Thelander, another of Earl’s 11 children. With what were later determined to be third-degree burns over 40 percent of his body, Earl crawled from the basement to his vehicle and drove more than three miles to his home, waving at people as he passed, said Vicki Gray, his daughter. Earl was taken by ambulance to Burgess Health Center in Onawa. Initially, Gray said, her father didn’t look too bad — his face a little red — and he had been joking with family members after being admitted to the Onawa hospital. More than 30 people gathered at the Onawa hospital, the largest gathering of a family at that hospital, Byron said nurses told him. But almost immediately, doctors told the family Earl’s chances for recovery were slim. While Earl was in a medically induced coma, they said their goodbyes. “I just told him how proud I was of him,” Doug said. Earl was airlifted to the burn unit at Clarkson Hospital in Omaha, where he died. In the days following his death, family members received more than 1,000 cards, Gray said. The investigation remains open, in hopes that someone who knows who broke into the home will talk. It’s unknown if the culprit was simply passing through the area, but Pratt has been in contact with salvage yards in Onawa, Sioux City and Omaha. The sheriff’s office has interviewed 20 people so far, Pratt said. He’s also notified all sheriff’s offices in Iowa about the investigation. Doug talks to Pratt every Thursday to check for any new developments. “The case file has been left on my desk … it’s a constant reminder,” Pratt said. Doug believes someone in the community knows more about the burglary, and he is calling on decent people to take their community back. Last Wednesday, Doug, Byron and Vicki gathered outside the house where Earl was hurt but didn’t want to go inside. The walls were still held up by poles. It was then that Gray spoke about losing her 19-year-old son, Bobby, in 1998. Years ago, Bobby wrote about how he’d like to be reincarnated as an eagle so he could see everybody from the sky. It’s not often one spots an eagle in Onawa, and Gray said Bobby is often symbolized by a hawk. Recently, Gray spotted two hawks perched on two telephone poles, a sign, she believes, of Bobby and his grandpa, Earl. One hawk flew off, soon followed by the second. Officials are offering a Crimestoppers reward for information leading to an arrest in the case involving the theft of copper tubing from Earl Thelander’s property and his subsequent death. Anyone with information about the crime is urged to call the Monona County Sheriff’s Office at (712) 423-2525.